Most users can't afford to spend so much time in reading the user manual in detail, so we have edited this quick start guide to help you get on track as soon as possible. It includes concise and clear explanation of core tools and tasks with corresponding screen shots. No matter what kind of diagrams you want to create, you will benefit from learning some basic steps for easier operation. Let's build a mind map as an example. 2. 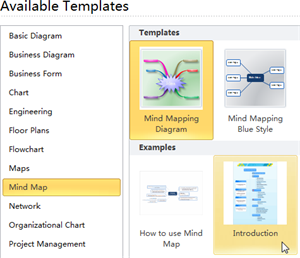 Click the big Mind Map category under Available Templates. 3. Click the icon of a suitable template. 4. Double click the example you like. After you open a template or example, the related libraries open, too. Drag the shapes you need and drop them on the drawing page. 1. 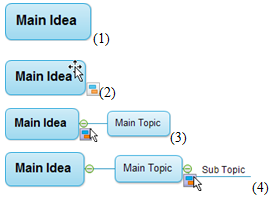 Drag and drop a Main Idea Mind Map shape on the drawing page. 2. Move the pointer over the Main Idea shape to show its floating button. 3. Click the floating button of Main Idea shape to add main topics. 4. Click the floating buttons of Main Topic shapes to add sub topics. 5. Shapes connect automatically in Mind Map. Note: According to different diagrams' features, shapes are designed specifically. Connecting Basic Flowchart Shapes is a little different. They can be connected in four directions as shown by the right picture. 1. Drag a Basic Flowchart Shape from the shape stencil. 2. Drop it on the drawing page. 3. Move the pointer over the shape to show the blue AutoConnect Arrows. 4. Click the blue Arrow that points toward where you want to connect the second shape. 2. The green round Control Handle and green square Selection Handles appear. 3. Drag the Control Handle to rotate the shape. 4. Drag one of the Selection Handle to resize it. Note: The handle being used turns orange. The pointer turns into arrows to show directions. 3. Click any blank area in the drawing page or press ESC to finish typing. In addition to shapes, you can also add text to other objects including even connectors following the same steps. Tip: Edraw shapes have smart features that you can find by dragging them or clicking the floating buttons. A good way to figure out what a shape can do is to right-click it to see its shortcut menu. If you're building an organizational chart, click the floating button to add subordinates or colleagues. 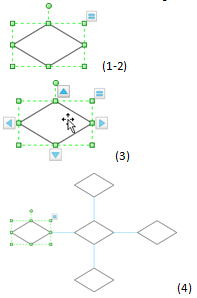 These shapes automatically connect to show the hierarchy. 1. On Home menu, click Select tool. 2. Select the part you want to color. 3. Move the pointer to the Color Bar at the bottom of the drawing page. 4. Click the color you like. After mastering the above steps, you definitely are capable of creating simple diagrams by repeating some of the steps. Try Edraw and you will have an extraordinary drawing experience. 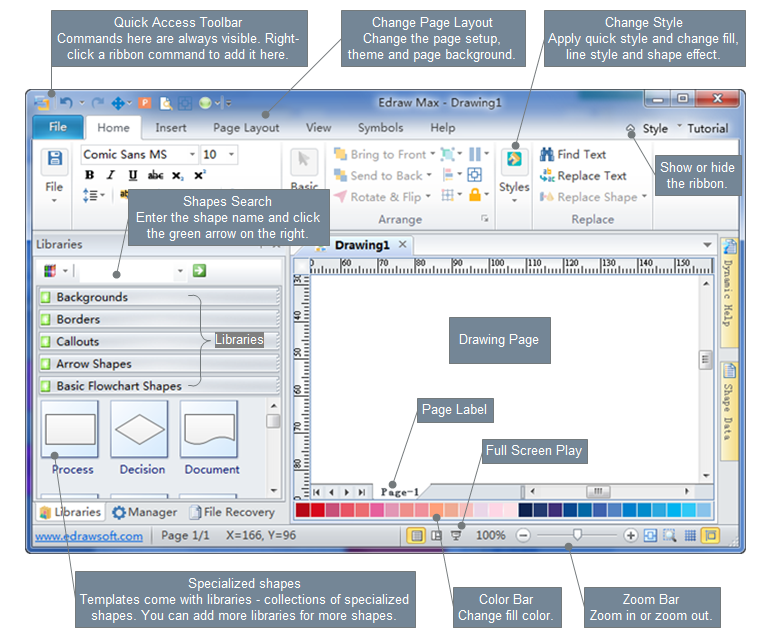 See the following illustration to learn the interface at a glance.